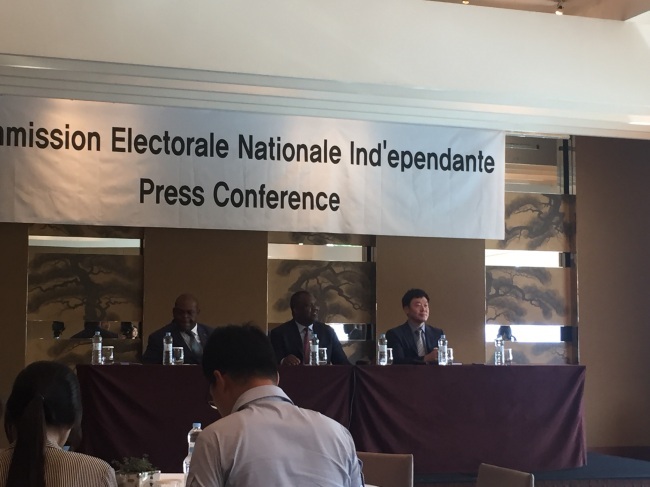 Corneille Nangaa, the head of the electoral commission of the Democratic Republic of Congo, said in Seoul on Tuesday that “very few” in his country are against the idea of using the much-disputed South Korean-made voting machines for the African nation’s long-delayed presidential election set for Dec. 23, just a day after Congolese police violently dispersed a protest against the machines in Kinshasa. Congo will not cancel the deal with the Korean supplier in spite of pressure from the international community and Congolese protesters, he added. “Of course there are people who are against the idea in our country,” Nangaa, who is currently in Korea for a visit, said in a press conference Tuesday at the Grand Hyatt Seoul. He spoke in French throughout the event, and a French-Korean interpreter assisted him. The upcoming election in Congo seeks to end the troubled Central African nation’s political crisis, which has given rise to deadly protests. Much of the violence that has plagued the country is linked to incumbent President Joseph Kabila, who has stayed in power beyond his constitutionally mandated two-term limit by deliberately delaying elections. The controversial Korean company, Miru Systems, is supplying some 105,000 machines to Congo as part of a $150 million contract. Critics of the deal, including the US, Congolese activists and Human Rights Watch, say the machines carry a high risk of undermining the reliability of the upcoming vote, as millions of people there are illiterate and lack access to electricity. On Monday, just a day before Nangaa’s press conference, some 22 pro-democracy activists in Congo were violently detained by the police in Kinshasa, for staging a peaceful protest against the introduction of the Korean-made machines, in front of the building of the electoral commission, according to news reports. Nangaa’s claims made Tuesday -- that only a few Congolese are against his electoral body’s decision to use the machines -- are also dramatically different from the results of a recent survey released by Congo Research Group, a New York-based NGO focusing on research projects on conflicts in Congo. In February, US Ambassador to the United Nations Nikki Haley warned Congolese authorities to use paper ballots or lose American support for the polls. 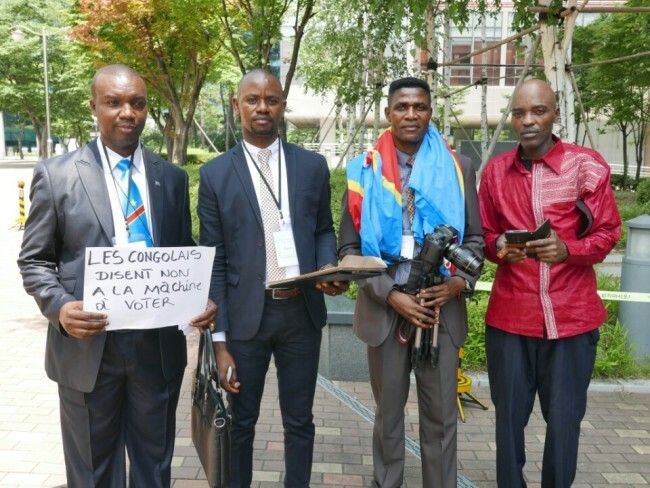 Last month, five Congolese political activists residing in Korea filed a complaint with the Korean NEC, asking the Korean government to prohibit Miru Systems from supplying the machines to Congo. “Most of the countries that have made negative remarks against Congo using the machines are (countries) that have attempted to export their own electronic devices for the Congolese election but failed,” he said, adding that he would not specify which countries he meant. Meanwhile, the Korean firm, as well as Korea’s National Election Commission, have been linked to a number of serious corruption allegations at home and overseas. Miru’s deal with Congo’s CENI was partially arranged by A-Web, a Korean NGO almost entirely funded by the Korea NEC, which connects Korean tech firms to foreign electoral bodies worldwide. Kim Yong-hi, who served as the head of both A-Web and Korea’s NEC, is currently under investigation by prosecutors on allegations of embezzlement and bribery, among others. Miru’s machines have also caused controversies in other developing democracies, including Iraq and Argentina. Nangaa said while he is aware of Kim currently being probed by the prosecution, it is irrelevant to Congo’s deal with Miru Systems. He also said Congo would remain a member of A-Web, in spite of the ongoing controversies involving its former head Kim. Congo Research Group’s report also includes an allegation that the son of Norbert Katintima, the vice president of Congo’s CENI, may have worked for Miru Systems in South Korea and used his personal connections to arrange the contract. Similar allegations have been made by a number of foreign media outlets, including Jeune Afrique, a French-language pan-African weekly news magazine. When asked about the allegation during the press conference, Nangaa said that while the son of Katintima, who currently works for CENI, studied in South Korea, he never worked for Miru Systems. “Such irresponsible and inaccurate media reports are unacceptable,” Nangaa said. According to Human Rights Watch, since 2015 nearly 300 people in Congo have been killed and hundreds more have been arrested for protesting Kabila’s election delays. “CENI doesn’t usually say the truth. We know our leaders by the way they used to behave,” said Bwelungu Nombi Henry, a Congolese activist living in South Korea, told The Korea Herald.